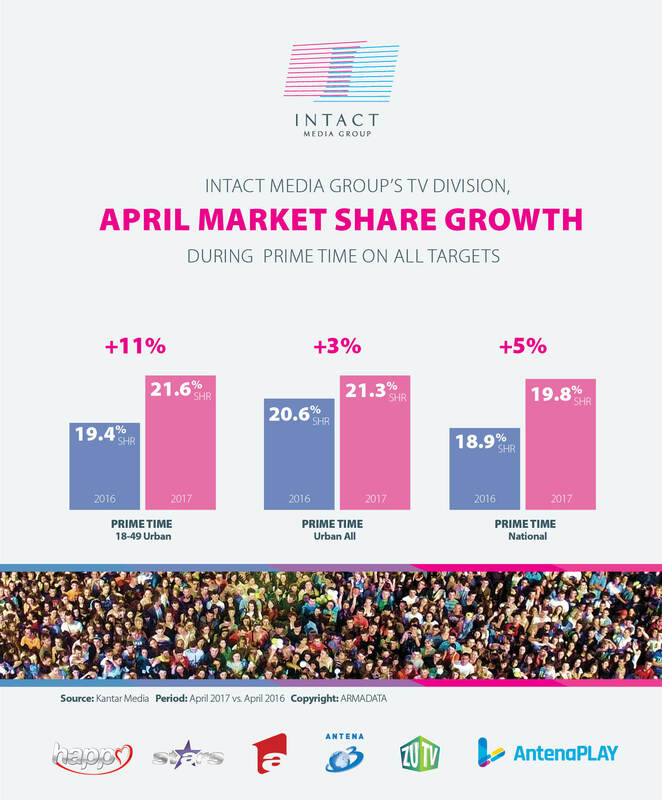 Prime Time numbers increased during April for Intact Media Group’s TV division on all targets (commercial, urban and national) compared to the same period of last year. This evolution is correspondent for the first four months of 2017, on commercial, urban and national level. 18-49 target: Intact’s channels have market share appreciations during Prime Time (+11%) and Whole Day (+4%). Urban All: the TV division leads during Day Time, Access and Late Fringe in April, while the Prime Time interval grows by 3%. The first four months of 2017 show leadership on Whole Day, Day Time, Access and Late Fringe intervals, compared to the same period last year, while Prime Time numbers evolve by 7%. National: Intact Media Group’s TV stations hold the first position during Day Time and Access, while Prime Time interval surges by 5%, compared to the same month last year. Day Time and Access leadership is correspondent to the first four months as well, while the Prime Time evolves by 8%. 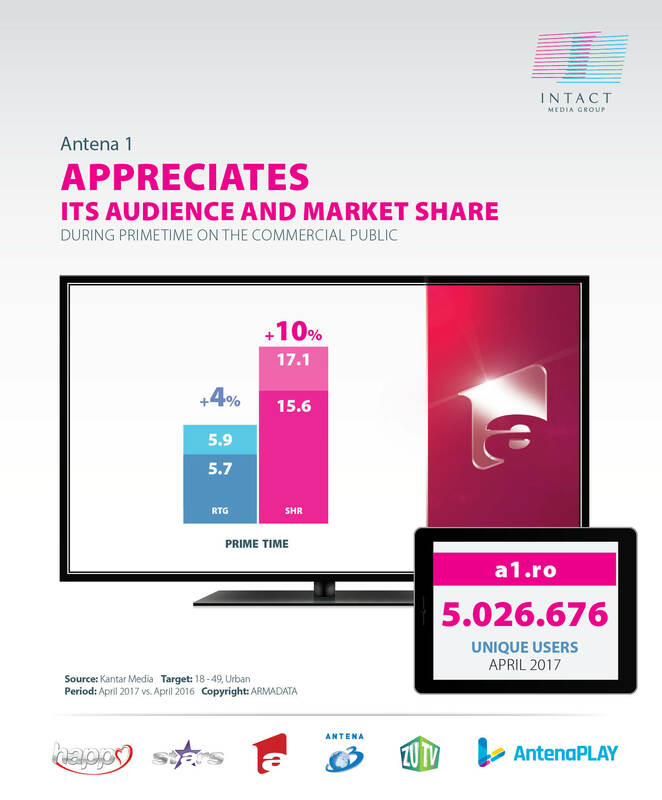 Antena 1, the flagship entertainment channel, home to the largest star system in Romania, has significant market share and audience evolution during Prime Time, on the commercial target. April market share numbers evolved by 10% during Prime Time and 25% during Late Fringe, while audience numbers rose by 4% during Prime Time, respectively 14% during late Fringe, on the 18-49 target. January – April 2017 sees Antena 1’s audience during Prime Time and Late Fringe on an ascending track (+5%, respectively +15%) on the commercial target, compared to the same period last year. The marked share also grew during Prime Time (+8%) and Late Fringe (+19%). Chefi la cuțite (Game of Chefs), iUmor (comedy), Zaza Sing (Singing Bee), Te cunosc de undeva (Your face sounds familiar) were April’s most watched productions. 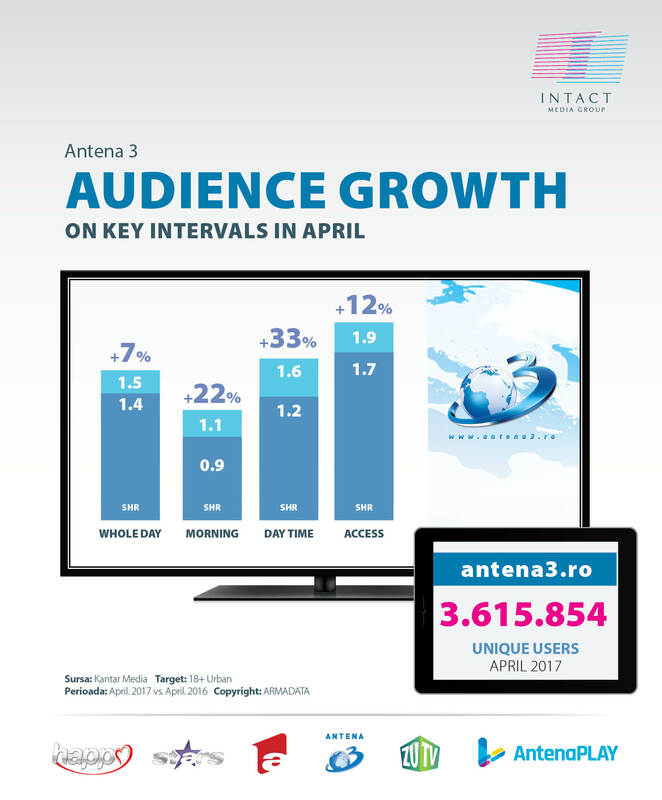 Antena 1 was watched in April, during Whole Day, for at least one minute, by 7.2 million Romanians, whilst www.A1.ro had more than 5 million unique users. 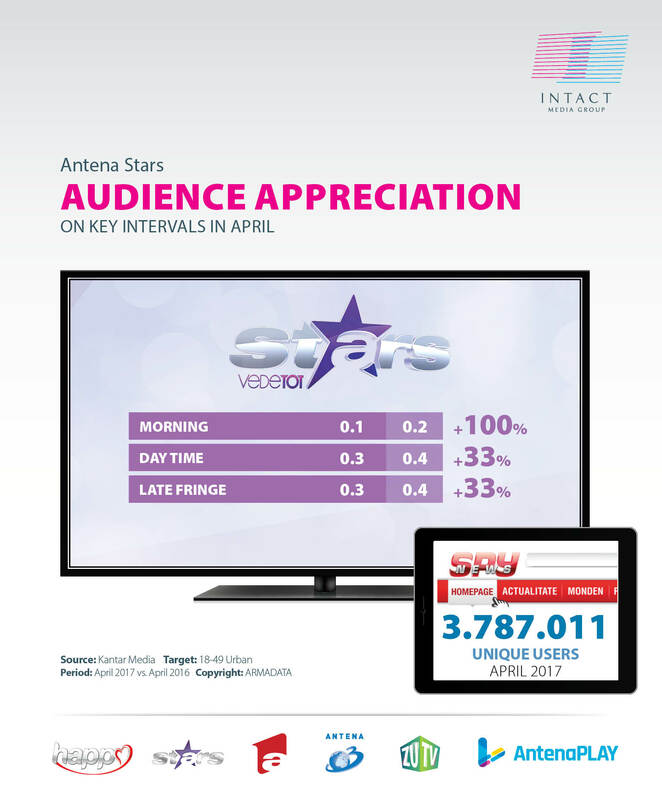 Antena Stars, the only TV channel dedicated to showbiz, had significant audience growth during April. The morning interval doubled its numbers, while Day Time and Late Fringe slots rose by 33%. Market share numbers also evolved on most time intervals, amongst which Whole Day (+13%) and Prime Time (+8%), on the urban commercial public. Over 2.8 million Romanians watched Antena Stars in April, on the national target, during Whole Day, for at least one minute. The most popular productions were “Supershow-ul de Paste” (Easter program) “Răi da’ buni”, “Alege Dragostea”, “Agentia VIP” and “Vedetop”. Happy Channel, the Group’s TV station addressed to daring women, had market share (+20%) and audience (+40%) appreciation during Prime Time compared to the first four months of the year (Target 18-49 Women, Urban population). The most popular series of the station included “Elif”, “Cand mama nu-i acasă”, “Sezonul cireșelor” (Season of cherry), “Downton Abbey”. Morning, respectively by 7% during Whole Day, while the market share rises by 7% during Prime Time and 15% during Whole Day. January -April 2017 sees audience and market share appreciation on all time intervals, compared to the same period last year. Audience numbers grow by 13% during Prime Time and 18% during Whole Day, while market share evolves by 19% during Prime Time and 21% during Whole Day. On the 18+ target, specific to the news niche, Antena 3 was watched in April by more than 3.7 Romanians every day, on the National level. “Sinteza Zilei”, “Adevăruri ascunse”, “Voi cu Voicu”, “Subiectiv”, ”Punctul de întâlnire” were the most watched productions in April. On the digital front, Antena3.ro had more than 3.6 million unique users in April. April also brought three medals for Antena 3 (gold, silver and bronze) at the New York Festivals. The gold went to “Viruși în sistem” feature report in the “Current Affairs” category and the silver went to “Romania ruinată” in the “Issues” category, footages under the banner of the much celebrated program “În premieră with Carmen Avram”. On the online front, Digital Antena Group was the only publisher in Romania with two of its sites in top 10 all sites in .ro: a1.ro (5th place) and spynews.ro (10th place). After five years in Antena Digital’s portfolio, a1.ro has come a long way, from the 28th position in .ro to the current no.5. Moreover, the page views figure is now almost triple to that of its main competitor, while the unique users have almost doubled. Over 9 million Romanians watched Intact’s programs in April during Whole Day, for at least one minute, on national level, while 7.2 million were reached during Prime Time.